Enjoy your island vacation in this spacious and tastefully decorated Florida-motif, direct gulf-front, two bedroom condominium. A gently swaying palm tree and the magical beauty of the Gulf from every room in the condominium adds a relaxing and romantic touch. Watch the dolphins at play, or simply relax and enjoy incredible sunsets of the Gulf of Mexico from the balcony. DIRECT GULF FRONT CONDO with a beautiful white sandy beach walking distance to a natural preserve, the incredible Hawaii type grounds, sparkling gulf-front pool, aquamarine waters, white sands, and breathtaking sunsets of the Gulf of Mexico on your lanai make this wonderful condominium vacation one not to miss. If you are in the mood to walk or jog, explore the seven miles of beach or head South and find tons of shells. Across from this condominium there is a marina where you can rent a boat and explore miles of coastal backwaters, a shopping center with a charming trolley to take you anywhere from the tip of Fort Myers Beach pier into Bonita Springs. Fine and casual dining and shopping is abundant. 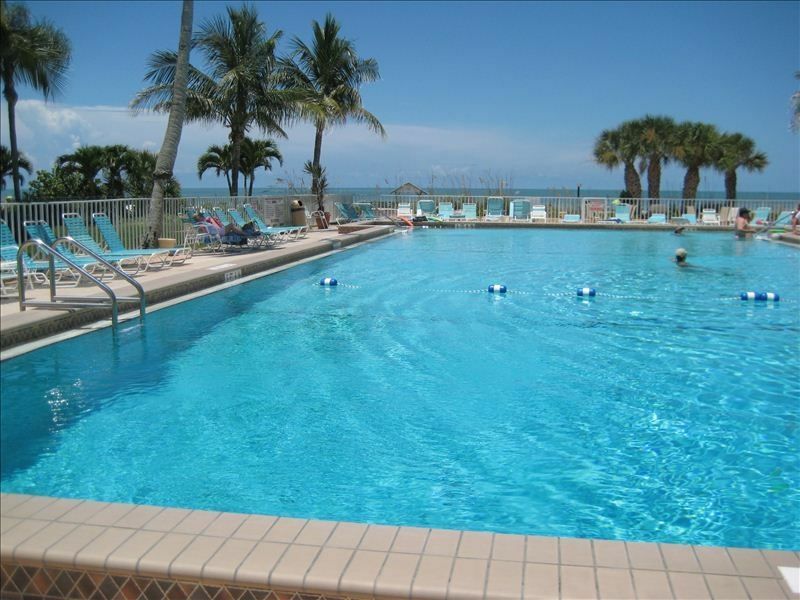 We have three direct gulf-front and pool view condominiums in this complex. Call for availability.